Submitted Stories from the Delta Dream Series! I’ll leave the voting open til Friday the 15th! Here are all 20 scenes on one image. I started with scene one upper top left corner and went across to scene 5 on the first row and so on. The house of love still stands, but you need a beer to get in .Remembering the day he first saw his sweetheart at that run down burger joint on wheels, he quickly found a pet animal to bring back home for safekeeping. After that, he ordered Netflix on his new dish and sat outside with his tall neighbor that always seemed to be posing and never changed his red shirt. He never went too far after his truck broke down in the weeds even though the service station served cake and pie, it was just too much cotton to wade through. Even with fresh modules of cotton out in the field his horses were suspicious of his actions after he hung that flag on the fence. There was no stopping him from wandering around town looking at old signs and trying to telepathically phone his sister for Chinese take out. Last week I saw him riding around town in an old firetruck and he was trying to wash graffiti off some walls but there wasn’t enough water pressure. He just lived in the hood, or maybe under the hood but always wound up at some intersection going right or left only and never could decide which way to go except back home to the house of love. My home feels like it is shrinking in on me. Even with satellite TV I am feeling alone. Toys no longer interest me I have tossed them out into the yard. To stop my worries I visited the local grocery to look at a bigger TV. The restlessness continued, now I am at the end of my road a decision on which direction to turn is at hand. I’m a big man feeling utterly lost. My appetite is needing more than the local Chinese delivery. I need to move on. The decision is made I am going to find a new place to set my roots. As my first task a visit to see the boss man and let him know he would need to find a new fireman for town’s fire engine. Next a collection of quarters allowed me to phone Mom and tell her I was moving on. She warned me to avoid cities full of brick building after brick building filled with graffiti and gangs. The last warning was to remember my roots and the value of living a simple life in the cotton farming community I knew so well. I assured her the American Flag flies over many great places and I was going to see a few of them. Knowing I would be away for awhile I covered the hay in the fields and left my gelding Winnie free to roam the fields until my return. The old pickup was fetched from it’s grassy spot and taken to Zeke’s service station for new oil and a tank of gas. Knowing I would need a place to lay my head, the old burger wagon was converted to a mobile home and I drove off to find my last stop, the house of love, a home that has filled my restless dreams. Wish me well. I’ve recently retired from my job. My plans were to travel the United States. Carefree, meeting people that are the true heart of this country. Not your big City, touristy kind of vacation, but in the rural, depressed areas. So I set a plan in action. My car is packed, and I laid my head on my pillow, my mind swimming with ideas, expectations and…DO I HAVE EVERYTHING??!!! How will I ever get any sleep? As my thoughts race through my mind, I begin to drift off. FINALLY!!! ….It’s MORNING!!!! YAY! Get up! Let’s GO!! Times-a-wastin’!! I make a quick check of my belongings. Yep, all seems to be there!! My cooler is packed with drinks and sandwiches. Only stopping for gas, and restroom time….that’s how I roll! So I leave my drive, cross over the river from Cincinnati into KY. ( I hate that bridge. Gives me anxiety every time. Something about jamming cars high above a river just doesn’t appeal to me. ) I’ll see where 8 hours gets me to and stop there for the night. Louisville, Nashville, Memphis all end up in my rearview mirror. Not what I’m looking for. As dinner time starts to near, I find myself in Mississippi. 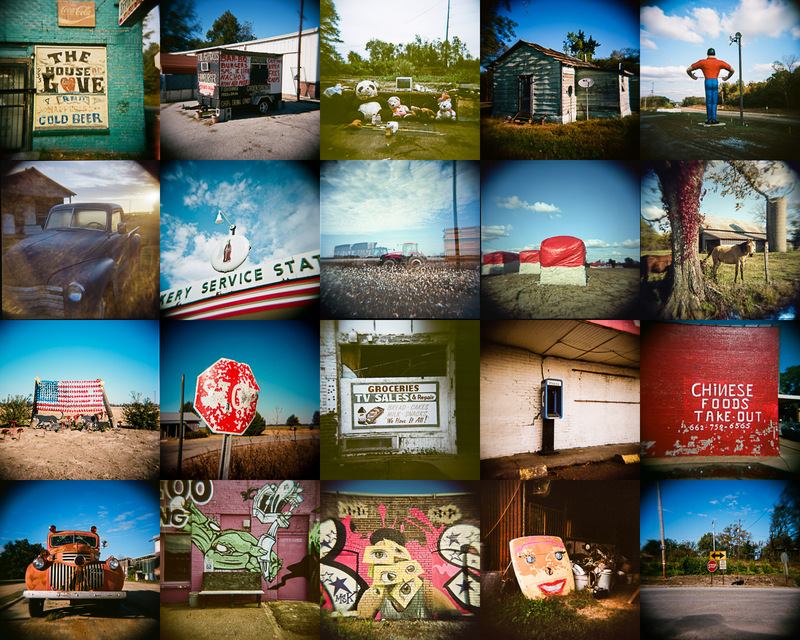 Hmmm, Clarksdale….Cool town, somewhat rundown, but I like it. I came to intersection with a rock-riddled stop sign. So that’s what the kids do here for fun, huh? Cottonfields with their baled cotton. COOL! Something you don’t see in Ohio!!! Then out in the middle of nowhere, it seems, I find a place to stay…The Shack Up Inn. It’s true to its name, Shacks and Recycled Junk everywhere. I get my room and walk around the grounds. An old blue truck sitting amongst the shacks near an Old Amoco sign. People sitting on the porches of their shacks enjoying each other’s company. Friendly wave from everyone. Nice!! So I get back in my car and go look for something to eat. Rundown buildings, security gates on windows and doors tells me there must be a lot of crime. I pass a parking lot with a homage of stuffed animals, half-drank bottles of Gatorade and sweet tea, blankets and a TV. Homeless? A Memorial of some kind? Not sure. LOL!!! Their idea of food truck makes me question my food options, here. Somewhat unnerving actually. I opted for Chinese, but I seem to have left my cell phone in my room. Went to use a payphone, lol, no phone in the stand. Great! I’m not feeling so safe for some reason, but I stop in The House of Love for a cold beer on this hot, steamy evening. As I walked in, I felt out of place, everyone turned and looked at me…the Outsider within THEIR surroundings. I ordered a beer. I was approached by an elderly local man, teeth missing, skin glistening from the humidity. “You ain’t from around here, is you?” I told him no, that I was from Ohio. He said he didn’t think I was safe there and to be on my way. I gave him a questioning look, downed my beer and left. As I got to my car, a couple of men were looking in my car. One had a crowbar or something and was beginning to raise it to strike my car. “HEY!!! STOP!! !” I startled them, they backed away but didn’t leave. “You ain’t welcome here, “ I was told. “No worries, gentleman. Just let me get in my car and leave.” As I opened my door, they pushed me aside, grabbed the first things they could get their hands on, my GPS and some change. I struggled with them, but they overpowered me and took my car. I chased them out of the parking lot!!! “HEY, MY CAR!! !” As they drove away, a hand comes out the window as I’m flipped the “bird.” I hear them laughing as they turn onto the street. What do I do? Where do I go? I begin to walk down the street. Empty buildings, decay everywhere. I’m beginning to feel woozie. Everything is spinning, cloudy, I can’t think or see straight. I think I’ve been slipped a mickey. I stumble around a street. I’m seeing double. Faces are distorted. This can’t be happening to me. I find a bench to sit on. I look over my shoulder and a HUGE green hand is about to engulf me. I can’t move, I begin to feel pain in my arm. Wait! What??!! What are you doing??!!! The big green hand is tattooing my arm. ARRGGHHHH!! NOOO!!!!! Oh Jesus!! Help me!!!!! I’m trying to get away, I can’t scream, I can’t run. I try to adjust my eyes. I blink and blink. What am I seeing??!!! I giant man! He’s chasing away the big green hand!! Oh God, thank you!!!! He doesn’t say a word and puts me in an old rusty truck and drives me away. We stop at a service station for some fuel. Where are we going, why isn’t he talking to me? He stopped at the Grocery store next door and bought me a sandwich and a coke. I’m starting to regain my senses. I half scared to eat the sandwich, but I was hungry and thirsty. We drove a little ways. I’m looking out the window. Am I still out of it? I see a face on a car hood. Is that another one of my hallucinations? We drove past a flag made of red, white and blue solo cups. I remember thinking, how inventive. But I want to go look for my car. I still don’t know where I’m going. He took me to an old shack . Barely standing, but it had a satellite dish. LOL. How can he fit in there? He’s so huge!! I want out of here. I jumped out of the car. I thanked the giant man and walked and he didn’t stop me. BEEP BEEP BEEP BEEP BEEP BEEP BEEP BEEP BEEP BEEP BEEP BEEP BEEP BEEP BEEP!!!!!!!!!!!!!!!!!! I begin to slowly open my eyes…trying to figure where I am now…I pick my head up off my pillow. I sit up, I look around, MY BED!! MY ROOM!!! Yes! I recognize this!!! OH THANK GOD, it was just a dream!!!! I may be rethinking that roadtrip….. The House of Love and Happiness, a place I encounter much too often. It’s here that I tend to drink my weight in cold, unforgiving alcohol. I know the men here well. We’re all here for the same reasons; loneliness, regret, yearning, heartbreak, hurt, sadness. The bartender tells me stories. His stories. Stories about how his wife left him after two years. Took his children and his money. And with that his happiness. He listens to me rant about my sickening life, all the wrong choices I’ve made, the few rights in the mix. He understands. I never knew my father well. He left when I was six, long enough to leave those memories of Daddy taking you to the park or to go get ice cream. But he also left memories of sadness; screaming, yelling, fighting. Long story short I was going to grab lunch at this rusty old food truck. The thing wasn’t a pleasure to look at, that was for sure; it had the menu displayed across the entirety of the trailer and was supported by two cinder blocks. But as I neared closer to the scene, a man came into view. He was a clean cut man in a sophisticated suit, yet his posture portrayed that he held the weight of the world upon his shoulders. Sadness oozed from the man, devastating his aura. Then, as if in slow motion he turned around, and I caught eye contact with him. But it was my own eyes that I looked into. It was as though I were looking into a mirror that foretold the future. This man was me. This man was my father. My buddies and I were never the best of people. Everyone judged us or made fun of us so we had our own way of coping. We’d take that rustic, blue death-machine-on-wheels down to a field about 10 miles from home. We’d spend days there getting high, then reaching a low, and then we’d have to pull ourselves back to reality. We kept stuffed animals out there, acted as though they were our friends. I’m pretty sure they were the realist friends I had. When everything looks the same you begin to try and find little details to mark where you’re at. For me, it was that stupid 20 foot statue of the man who held literally nothing. He just stood there in front of the run-down gas station, serving as their lazy mascot. But he helped me keep my sanity on the drive back from our private oasis. I went to Jimmy’s house once. I guess playing bartender means you don’t require much. He lives in a shed in the outskirts of town, and the inside doesn’t justify. He has a curtain cutting off his bedroom from the central living room/kitchen. Somewhat relative to Charlie’s home from Charlie and the Chocolate Factory. He invited me over for drinks and a little smoke. We smoked, we drank, we laughed, we cried; we did everything you’d expect two drunk people to do. I don’t think I’ve had that much fun in a while. Occasionally when I mix the right amount of pills I’ll find a sweet place that might be Heaven. The skies are blue with the perfect clouds adorning the canvas. Things fade in and out, but one of the most prominent visions is the red tractor in a field of pastel cotton. This takes me to that high, high place, but then I realize: why would I be going there? One of my high school acquaintances drove a fierce-looking orange truck. In the backseat we had all kinds and colors of spray paint. We took it to different locations where twenty or so people would work on one project. We once created a man with a face of eyes. Us junkies enjoyed making statements. Occasionally we’d do offers for business owners we knew well. I still remember one when time we painted for a good friend of ours who owned a tattoo parlor. We painted a hand coming from the sky with the mystical pen that would bestow upon the world the beautiful art in which the tattoo gods would paint on the canvas that is your skin. In other words, it was epic. I had to make a phone call. I don’t know who to call. I don’t know how or why I’m here. One phone. What to do? Who to dial? Who? What? Where? And why? I dialed a Chinese takeout restaurant. It’s a fiery red building with fiery red food. I don’t know how and I don’t know why, but that’s what happened. And I enjoyed the food. In another field in another part of town I find myself alone with hay bales and an American flag amongst trashy clutter. I get higher as I did with my old friends, and find myself to be having as much fun. But then everything gets blurred into a giant mob of red and blue. Signs. They’re all I see. Stop, turn, yield, stop, turn, stop. I see a grocery store. Except it’s not really a grocery store because there is nothing in there but broken glass. Why am I seeing this now? Faces, but not real faces. Painted faces, and just one face on the dislocated hood of a car. The scenery looks familiar. Reminds me of home. Man, I wish I was home right now. Speaking of home, I see a farm. A beautiful farm with cows and majestic trees. They climb to the sky and reach for God. I feel as though I’m reaching for God, but will he take my hand? Please vote for your story by number in the comments below! You have til Friday the 15th to vote! I like them all. Isn’t it one story? Thanks for the comment Drake! I had one story in my mind, but, it occurred to me there could be many others, and I thought this was fun to do.